Northeast India is an enigmatic and concealed ecstasy with astound virtuosity. The ‘Seven Sisters’ is the vault of traditions, heritage, natural beauty, history, adventures, culture and soothing experiences. Every state of Northeast is unique in its own way. Arunachal Pradesh, one of the ‘Seven Sisters’ holds the distinction of being the eastern-most state of the country. Arunachal is the ‘land of dawn-lit mountains’. It is perhaps the last sanctuary for India’s natural and anthropological heritage. This virgin land consists of 26 different tribes and the most advanced tribe is considered to be the Apatani, who are basically the agriculturists. The humankind of this land are patrons of dance and music. One such place is Ziro, where the people celebrate art and music with great enthusiasm and zeal. Ziro is a small picturesque valley tucked away in the lower Subansiri district of Arunachal Pradesh. This locale has pine clad gentle hills, mountain rice cultivation (known as Jhumma cultivation). Ziro is the district headquarters of Subansiri and is one of the oldest towns in Arunachal Pradesh. It is located at 27.63N and 93.83E at an elevation of 1688 metres (5538 feet) to 2438 metres (8000 feet). The climatic condition is very subtle even during summers, which is one of the major attractions of this place. The winters are cold and chilly, which gives quite a feel of any cold country. Ziro is inhabited by the tribe ‘Apatani’ and this fascinating tribe has nonpareil characteristics. Unlike the other tribes, they are non nomadic in nature. This tribal group is one amongst the very few tribes in the world that worship the massive nature (Sun and Moon). They practice permanent wetland cultivation in hilly terrain by slicing the hills. In April 2014, Apatani Cultural Landscape has also been added to the tents list of UNESCO World Heritage Site for ‘extremely high productivity’ and ‘unique’ ways of preserving ecology. The Apatanis are one of the most amiable and rustic people. Plausible, the most enthralling and alluring members are the older women of the tribe, who wear facial tattoos and massive nose rings. The tradition, though non existent now, dates back to pre modern times, when the Apatani women were considered to be the most beautiful in all of Arunachal Pradesh. The beauty of Ziro can be experienced by through the beautiful ‘fish farm paddy field’, the Talley Valley wildlife sanctuary, Kile Pakho, Megha Cave temple to name some. But, if you are a wayfarer and music lover then Ziro is the right place to be in, where the most amazing music festival is held. 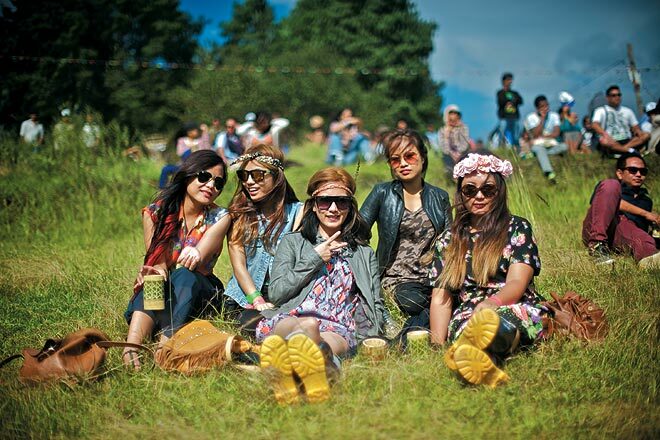 Ziro music festival can be said as the Tomorrowland of India. It is one of the most extravagant outdoor music festivals in India and celebrated with much oomph and ardency. It flaunts the independent music scene in India. The festival was founded in 2012 by Bobby Hano and Menwhopause guitarist Anup Kutty. The festival is spread over four days and is hosted by the members of the Apatani tribe. This is an evidence that the Apatani tribe is not only affable folk but blithe some and music passionate. National and International artists such as Steve Shelley, Lee Ranaldo, Induscreed, Peter Cat Recording Company, Barmer Boys, Sha’air and Func, Louw Majaw, Menwhopause and Guru Rewbeu Mashangua among others, have taken the festival to new heights and hence witnessing large crowd pouring in. In a nutshell, Ziro music fest is four days of great music, art, culture and high spirits and contentment.